Crunchy vanilla crust gives these sweet, brioche-like rolls their namesake seashell appearance. They are popular in Mexico for a light breakfast, served warm with a cup of coffee. 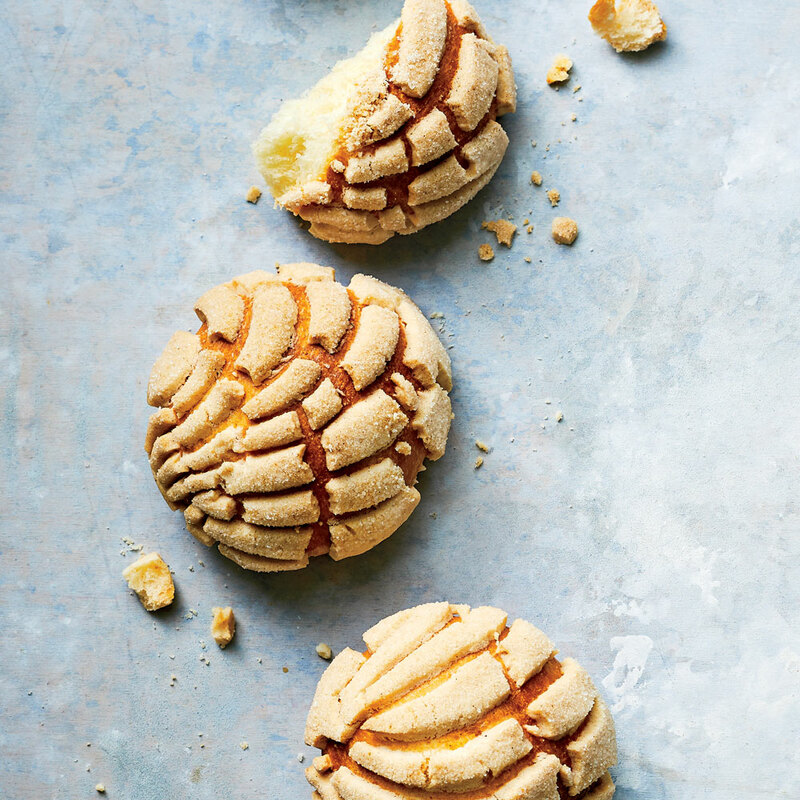 “For me, experimenting with the Mexican tradition of sweet bread has always been fundamental,” says chef Elena Reygadas of Panaderia Rosetta in Mexico City. She enriches her dough with eggs and butter and let’s the dough rise slowly overnight, with airy results. Stir together 3 3/4 cups flour, sugar, yeast, and salt in a large bowl. Make a well in center, and add butter, milk, and eggs. Using your hands, combine mixture in a circular motion until ingredients are incorporated and a shaggy dough forms. Transfer dough to a lightly floured surface. Knead, lightly striking dough against surface and adding up to 2 tablespoons flour, a few teaspoons at a time, until dough is smooth and elastic, 6 to 8 minutes. Place dough in a lightly greased large bowl. Cover with plastic wrap, and let stand at room temperature until slightly risen, about 1 hour and 30 minutes. Chill dough 8 hours or overnight. Divide dough into 12 (about 2 3/4-ounce) pieces, and shape into balls. Place dough balls on 2 parchment paper–lined baking sheets, and brush lightly with egg wash.
Preheat oven to 350°F. Divide Vanilla Crust Dough into 12 (about 3/4-inch) balls. Working with 1 Vanilla Crust Dough ball at a time, use fingers of both hands to pass ball back and forth until it flattens into a 3-inch circle. Top each concha dough ball with a Vanilla Crust Dough circle, gently pressing until molded around each. Mark tops by gently pressing with a 4-inch-round shell-pattern mold (or use a knife to make a shell pattern). Dip conchas, shell side down, in granulated sugar, and return, shell side up, to baking sheet, spacing conchas at least 3 inches apart. Let stand, uncovered, at room temperature, until slightly risen, about 2 hours. Bake conchas in preheated oven until dough crevices are golden brown, 20 to 22 minutes. Serve immediately.